During summer, the village organizes the feasts of Agios Athanasios (May 2nd), Agios Nicolas Junior (May 8th), Prophet Ilias (July 20th), Agios Paraskevi (July 25th and 26th) and Virgin Maria (September 8th-10th). There are events throughout the year, such as the Spring Plant Fair, the International Guitar Festival, as well as numerous music events organized by the Culture Association. Christmas, Easter, Halloween and national holidays are celebrated in a special way with the assistance and participation of the cultural association. 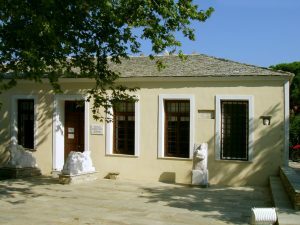 Fabio Museum, where you can admire paintings and sculptures of the so-called artist Athanasios Fabas, who was born in Lafkos, lived and studied in Romania and his sculptures can be admired in various places in Greece. Radio Museum “Antonis Tavanis”, donated by the German citizen Wilfred Seps. *Museums are open every day during summer and upon consultation in winter. village, while the chapel of Prophet Ilias is located on the highest part of the village with an incomparable view. 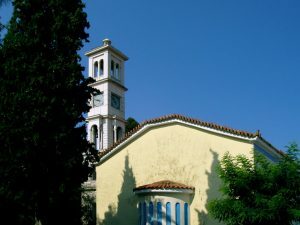 The chapel of Agios Nicolaos of Vounainis, built in 1820, hidden among the trees in the intermediate path of Lafkos-Platania. The chapel of Agios Ioannis in Sara, in Lafkos-Milina path. 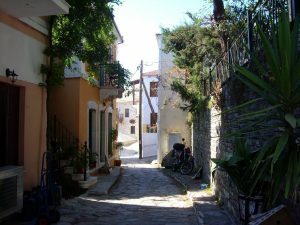 The square is one of the largest ones in Pelion, with trees standing proudly over time and generously offering their shade. Stone fountains, Paliovrysi, Chatzovrisi, Kainouria Vrisi, from which the residents supplied water in the past. The cobblestone streets surrounded by old mansions, travelling back in time.